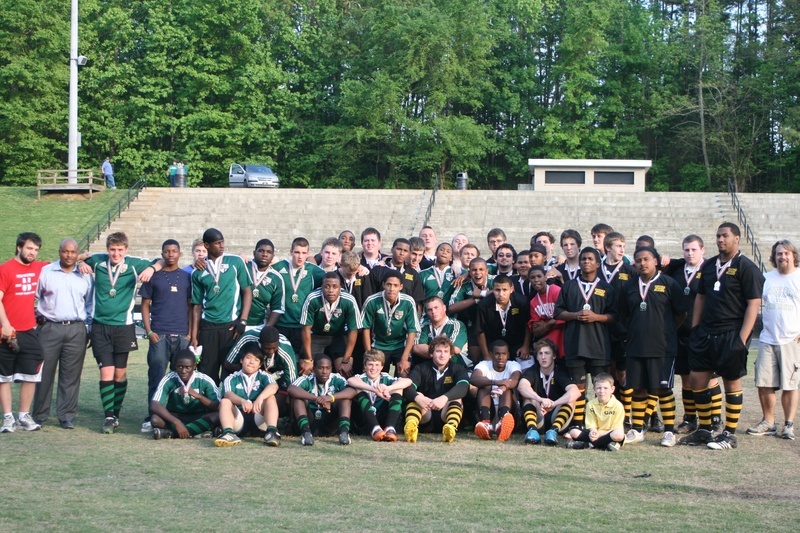 High School Rugby in the State of North Carolina is a Recognized Club Sport, under the supervision of each School Principal, School “Inter Club Council” and/or the designated staff advisor or Club Sponsor. NC State Board of Education Policies for Extracurricular Activities. Districts (LEA) Board of Education Policies for Students Lead Organizations, Clubs and Extracurricular Activities. 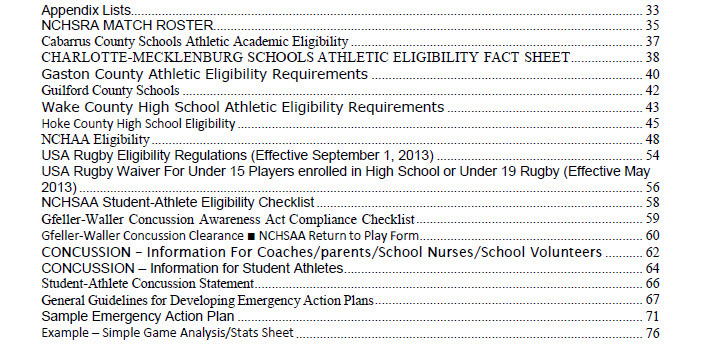 High School Athletic Eligibility Standards for Clubs and Players. It Is the Head Coach’s responsibility to ensure that his Team and Players meet all NCHSRA eligibility requirements as outlined in this section. NCHSRA will not actively verify player eligibility. All Teams must maintain eligibility documentation as proscribed by their school district policy and must provide NCHSRA with any requested documentation upon request. Division 1 is being referred to as “A” side or Varsity side. Division 2 is being referred to as “B” side or Junior Varsity side. All new SHS teams will play in Division2, their first year of competition. Existing SHS teams/clubs having played in Division 1, have the opportunity to declare, at the beginning of the planning season period (Nov - Dec), whether they would like to remain in Division 1 or move down to Division 2 , due to lack of # of players, lack of experienced players (e.g. mostly freshman) etc. If there is an existing SHS rugby club at a high school, players from that school must play for the school. No MHS club should attempt to encourage/lure/poach/recruit players from that school for a MHS club. An enrolled student, who is already playing for a MHS club at the time the SHS club is formed, can be grandfathered in and stay with the MHS club. These same players, still have the option (and should be encouraged), to switch over to their high school, if they so choose. 1.1 A High School Team (HST) is defined as a club that has been formed at an accredited High School (Grades 9-12) in the State of North Carolina by students, and expressly for their enjoyment. 1.2 A HST must be fully recognized by the school administration and/or school district as an officially sanctioned school based extracurricular club. It is subject to the rules, regulations and policies of the team’s Home School (as defined by its local School District) and/or School District. 1.3 A HST must be led by a Faculty Advisor as designated by the team’s Home School’s1 principal. 1.4 A HST may be comprised of an unlimited number of students. It may be subdivided into several smaller teams (Sides) for the purpose of inter-scholastic competition. 1.5 The 2011 “Visiting Player” exemption is no longer in effect. All students competing in a NCHSRA qualifying match must be enrolled in the HST’s Home School. Alternative or extended day school students who meet all other eligibility requirements may participate in athletics for the school to which they would normally be assigned, provided the alternative/extended day school has no athletic program. The alternative schools referenced here are those operated by the school system itself. 1.6 A HST must be open to all students registered and enrolled at the team’s Home School, regardless of gender, and must comply with all Home School and /or School District eligibility requirements. 1.7 A HST must have separate designated sides for men and women. Coed sides are strictly prohibited for the purpose of competition in any NCHSRA contact event. 1.8 A HST must register with USA Rugby annually and must be in good standing with USA Rugby to participate in any NCHSRA qualifying match2. 1.9 A HST must submit a letter of intent to field a team for the season no later than the last day of November. 1.10 A HST Club must register at least (1 competitive side) with NCHSRA, submit all NCHSRA registration materials and pay all NCHSRA registration fees no later than the last day of December. 1.11 Eligibility of any HST or additional Sides (as defined in 1.4) created after the registration deadline is solely at the discretion of the NCHSRA. The following eligibility rules are designed to create basic statewide eligibility standards. They are based on the NCHSAA and USA Rugby eligibility requirements. Most Local Education Agency’s (LEA) have established their own eligibility rules. Where NCHSRA eligibility rules and LEA rules conflict; the LEA rule will take precedent. If an eligibility situation arises and is not covered in this document, the LEA, then NCHSAA and finally USA Rugby rules will be applied. All teams/players are responsible to acquaint themselves with their own LEA rules and may refer to the NCHSRA website for NCHSAA and USA Rugby eligibility rules. 2.1 All students participating in any NCHSRA qualifying match must be registered with USA Rugby and have an active and valid CIPP number. 2.2 All students participating in SBT sanctioned events must be enrolled in an Accredited High School as defined in Sections 1.1 through 1.3 and must be seeking their diploma. 2.3 All students must play for their Home School’s team and may not play in a Qualifying Match for any other club in a fifteens match, including High School team or clubs, College Clubs or Senior Club competitions, while those players‟ High School Qualifying Match season is in progress. 2.4 All Students must have completed (signed) medical insurance waivers and coverage’s – for both the school and USA Rugby. 2.5 Students must be currently enrolled in at least one-half of the minimum academic course load. 2.6 Students must meet local school promotion standards. 2.7 Must have passed a minimum work load4 during the previous semester. 2.8 Students must have an 85% attendance record from the previous semester. 2.9 Students must meet all local GPA and eligibility requirements of the LEA. for a period lasting longer than eight consecutive semesters, beginning with the student’s first entry into grade nine or participation on a high school team, whichever occurs first. For students who skip the ninth grade and advance directly to the 10th from the eighth, the year prior to entering the 10th grade is considered the year of first entry into ninth grade for athletics. The principal shall have evidence of the date of each player’s entry into the ninth grade. The North Carolina cumulative record is sufficient. contest if he has taken part in contests during four separate seasons in that sport (one season per year, whether the sport is played in North Carolina or not). Playing as a member of a private or other non-member school team shall be deemed the same as playing a member of a school team. Enforcement of this rule is to begin with entry into ninth grade, however. 2.12 A student shall not participate in school athletic contests after graduation from high school. This does not apply to spring graduates of the current school year participating in state, regional and/or national playoffs or competitions, arising out of, and that extend after the end of the current school year. 2.13 AGE OF PLAYER: No student may be approved for any athletic contest if his or her 19th birthday falls on or before the first day of the current school year. The principal shall have on file evidence of the legal birth date of each athlete. 2.14 A student athlete who changes schools after establishing a sports school, unless the school is the student’s Home School, is ineligible for 365 days. 3.1. A player who has participated in a NCHSRA qualifying match who is deemed ineligible is automatically disqualified for play in any NCHSRA sanctioned event for the remainder of the season. 1. The Team can show that the player intentionally filed fraudulent paperwork. 2. The team can show that they did their due diligence and followed NCHSRA recommendations for ensuring that the player was in compliance. 3.3 In the event of a 2nd eligibility violation in a single season the HST forfeits all claims to post season state, regional and national play. The Head Coach shall be placed on probation. 3.4 If the HST is found to have a committed a 3rd eligibility violation in a 12 month period the Head Coach shall be suspended for the remainder of the current season. This suspension may be levied for up to one year from the date of the final offense. During the suspension period the coach may not participate in any USAR/Rugby North Carolina/NCHSRA youth program. 1. “Home/area school” is the school that serves the area where the student lives and is based on the residence of the parent or legal custodian (court ordered custody, not guardian). Students must live with the parents or legal custodian and may not have two residences for eligibility purposes. No student may participate at a second school in the same sport in the same sport season except in the event of a bona fide change of residence of the parent (s) or legal custodian. Change of schools must be contemporaneous with change of address. 2. A “qualifying match” is defined as a contest occurring as part of an organized, scheduled season that may or may not lead to a State or National Championship. 3. LEA - Synonymous with a local school system or a local school district, indicating that a public board of education or other public authority maintains administrative control of the public schools in a city or county. 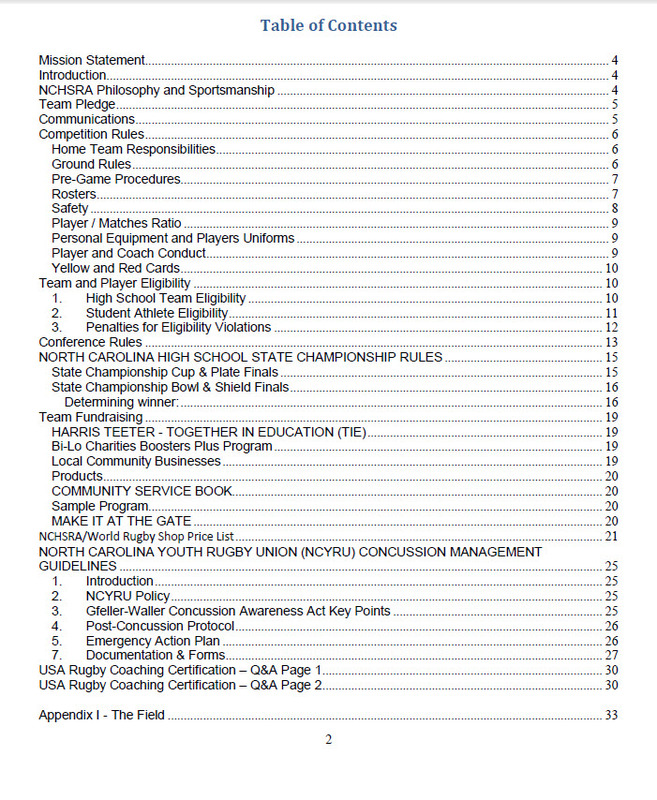 *** This is a USA Rugby National High School Club Championship regulation. School athletic programs have varying age requirements. E.g. Mecklenburg County Schools age requirement is 18 years or younger as at October 16th of that school year. We will use the USA Rugby National High School Club Championship regulation.